Off message but recommend this marvellous recent summer holiday walk, 11k (4 hours-ish) alongside Madeiran Levadas (irrigation water channels) in stunning mountain countryside. Madeira is an Atlantic Portuguese Island off the coast of Africa and a little bigger than Anglesey (north Wales) which gets a lot of rain in the mountains located in the north of the Island but most of its famed agriculture is in the south. So for hundreds of years they have been building thousands of miles of "Levadas" to bring the water across the mountains to where it is needed. This is a great tourist opportunity since there is usually a pathway next to these Levadas and you can walk along them and enjoy spectacular scenery with little or no effort. since for water to flow the gradient has to be slight. However, since Levadas are cut alongside the side of mountains you can find yourself walking alongside sheer drops, which can be a little scary at times but there are generally fences on most (not all) of the really sheer drops. Most of the Levadas are "linear walks" so you need to take a bus or taxi to the start and back again from the finish. Madeira has an excellent public bus network but is fragmented and has complicated timetables. However, most drivers speak good english and are very patient being used to disorganised foreign travellers. 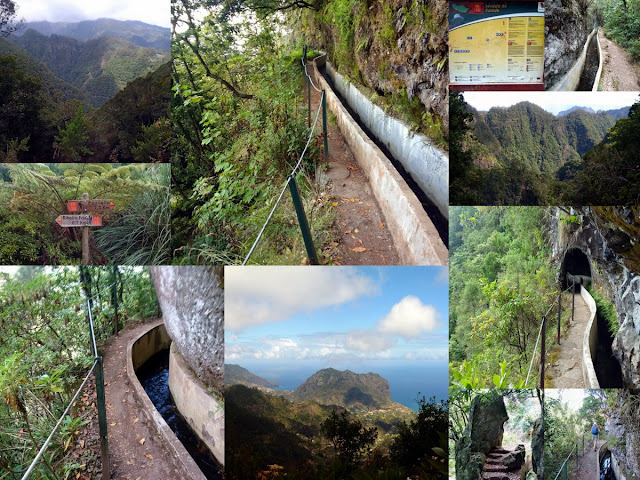 Levada do Furado (Code PR10 Ribeiro Frio to Portela) is one of the oldest Levadas and described as a "Classic" walk. . We got to the start at via the HDF No. 56 bus from Funchal. The bus was full but luckily they laid on another. A good reason for catching the bus at the beginning, behind the lower cable car station. The walk is fairly well sign posted but take a decent map and walking guidebook just in case. It was a stunning walk with lots of shade and spots to stop and stare at the amazing scenery. There were not that many other walkers (maybe we were lucky) so there was a feeling of isolation, peace and quiet. There was a few areas where you had to be a bit careful but if you take your time and have decent footwear you should be fine. Lovely views (and ice cream) at end of walk in Portela. The bus back was the SAM No. 53. The stop is obvious and opposite the Bar & Restaurant "Portela Vista". Nearly all buses start and finish in Funchal.